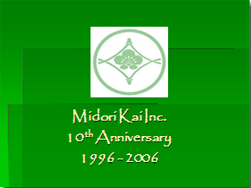 Midori Kai, Inc., a non-profit corporation (Federal Tax ID #77-0561406) was established in 1996 and our 10th Anniversary occurred in September 2006. Midori Kai was founded with the objective to create an effective organization comprised of Japanese American professional women leaders with various business and creative backgrounds, who are committed to community involvement, supporting local non-profit organizations, mentoring youth, and celebrating our Japanese American heritage. Midori Kai is a cohesive group of professional women, who are focused on personal, professional and cultural development, as well as sharing our knowledge and experience to benefit others. Midori Kai has recently established an endowment to insure our ongoing ability to contribute to specific local charities and community events throughout the years. Established a highly successful annual Midori Kai Asian Arts & Crafts Boutique, proceeds of which are donated to local non-profit organizations selected on a bi-annual basis.